I sent for a new password on February 25 at 2 AM, ( EST, USA ). I received an answer being sent from them indicating it was sent February 25 11:55 PM their time. It looks like they are still showing they have a branch in Djibouti. The Zimbabwe dollar no longer to exist . If you have any you can use it for wallpaper or frame it . Use of the Zimbabwean dollar as an official currency was effectively abandoned on 12 April 2009. It was demonetised in 2015, with outstanding accounts able to be reimbursed until April 30, 2016. In place of the Zimbabwean dollar, currencies including the South African rand, Botswana pula, pound sterling, Indian rupee, euro, Japanese yen, Australian dollar, Chinese yuan, and the United States dollar are now regularly used. Yes, good thing. Irans central bank is going to lop their currency. Iran rial is currently 1US$= 40,000 rial. It is part of the Iraq central bank education program telling the public the difference between Iraq’s revaluation and Iran’s lop. Iran is removing the zeros off of the printed currency with no change in value. It does not say what the reevaluation of the Iraqi dinar is going to be. It does clearly state the difference between the two countries and what they intend to do with their currency. It is and will be legal for the Iraqi Citizen to trade dinar and riel with Iran. The new currency of both countries is going to make it very confusing for the public. This is part of the public education presented by the central bank of Iraq. I want to see an exchange rate that will put a camel in every Iraqi home now . A lop of the currency would do nothing to immediately increase the purchasing power or the standard of living for a common Iraqi person . Calm returns to Iraq's Basra after week of violent protests #InsideIraq Troops sent from Baghdad have reinforced police numbers, while government offices and markets reopened after a quiet night. Get him out of the country so that Interpol can pick him up ! On the 86th anniversary of the first Iraqi Dinar .. Do you know this information about our currency? 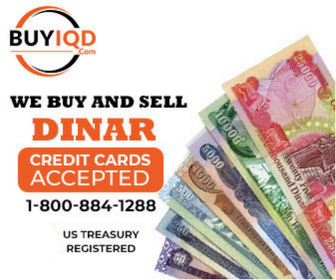 It has been too long and CBI is making the case to the public of why the dinar is going from worthless donkey dung to $3.00 per 1 Dinar. Same-day turnaround for emails to my bank in Iraq, Warka Bank. That is definitely a step in the right direction. Surprised the heck out of me. I sent the email 3/7/2018 and received an answer the same day. This is from a figment of my imagination of what really goes on behind closed doors! FYI, I sent a password request in January 2017 there was a less than five day turnaround. This year I sent a password request on 1/23/18 and did not receive the new password setting until 2/20/18. Have you ever held a snake down by its head, watched it squirm in all different directions, not yet cutting the head off but the snake knows it’s coming. I’m sure Maliki can relate . Maliki was a triple agent . He worked for the US, Lebanon and Iran.